What happens when you don’t see the “me” in dementia? If you don’t see the “me,” you see the dementia instead, and when you see the dementia, the “me” or the “I” becomes an “it.” You’re seeing a disease rather than a person. If you don’t see the “me,” you get physicians who speak to the caregiver when revealing the diagnosis, and not the person diagnosed. And you get the newly diagnosed person leaving the doctor’s office with a prescription for drugs to fight symptoms of the disease and little-to-no information on how to support the “me” with the disease. If you don’t see the “me,” you get spouses and family members who become “care givers” and not “care partners” recognizing that the “me” is a full partner in management of the disease. You have care givers taking over all responsibilities from the person with dementia, unintentionally sending a message to the “me” that he or she is unworthy of support in continuing to function in the home, workplace, and community. You have “me’s” that become devoid of purpose, self-confidence, and self-esteem, and when coupled with disease symptoms such as apathy, the “me’s” are gradually lost, becoming passive dependents instead of active participants in their own lives. If you don’t see the “me,” you get people with disabilities caused by dementia who don’t receive the same rights as others with disabilities in countries that ratified the UN Convention on the Rights of Persons with Disabilities. Under this convention, people with disabilities moved from being “objects of charity, medical treatment and social protection towards viewing them as full and equal members of society, with human rights.” It’s pretty obvious that the “me” with dementia isn’t quite there yet. 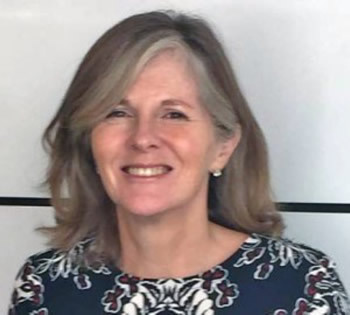 If you don’t see the “me” in the person with dementia, you get a society that does not pay attention to taking down the “social, attitudinal and architectural environments that are the barriers to an individual’s participation” in their communities. You get a focus on a “cure” for the disease rather than systemic support for creating a world in which the “me” with dementia can participate as an equal member of society to the full extent of his or her abilities. If you don’t see the “me” in dementia, you get committees, councils, campaigns, programs and projects focused with good intentions on improving life for people with dementia and care givers, and yet do not include ONE person with dementia in the planning stage, or — as a tick in the box — choose a person or two to run things past once already decided. You get people who — seeing the disease rather than the person — don’t think it’s necessary to include the “me’s,” or who are uncomfortable or scared or don’t think that people with dementia are capable of any sort of meaningful contribution, or for whom inclusion of people with dementia simply is not on their radar screens. You get, as was brought to my attention this morning (thank you Mary Beth Wighton), people with dementia not included as “witnesses” to come before the Canadian Senate Standing Committee on Social Affairs, Science, and Technology to testify on the “Study on the issue of dementia in our society,” which freakin’ is ABOUT people with dementia. “Nothing about us, without us?” Indeed. If you don’t see the “me,” you sideline brilliant minds. I think of the people I know who have dementia, who are activists and whose ideas are changing their communities, their countries and the world for the betterment of the lives of people with dementia, and who have had to fight and continue to fight every single day of their lives to be heard, because they among all their peers have the resilience, the bravery and the support in their close circles to stand up and say “No More!” And when I think of how close each and every one of them came to being silenced because at some point they were encouraged to withdraw rather than fight, or who lost heart after being left out once again, and how close we came to losing their brilliance, their shining lights, their creativity, their ideas, their empathy, their inspiration, their FIGHT and leadership, well, my stomach drops and I feel nauseous. And I think that for every activist with dementia who chooses to fight on, there are 10, 20, a thousand, a million who didn’t have the same resilience and encouragement and were silenced. And that’s what happens when you don’t see the “me” in dementia. Silence. “See Me” t-shirts are available for sale on this website. 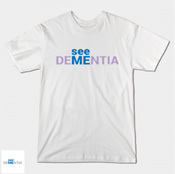 Sales of t-shirts support projects that amplify the voices of people with dementia, such as To Whom I May Concern and My Dementia Story. Click here to go to the t-shirt page.